Irony is overworked and soon to be a cliché. But what else do you call a death by slaughter of a man committed not only to non-violence, but to alleviating the plight of those who killed him? His story reveals the evolution of integrity, generosity, courage, and just enough disregard for personal security to court risk and succeed too well. Joe Bissonette reached adulthood convinced his highest calling was to help and advocate for those with least. The path appeared to be through the priesthood. This book offers the evidence of his success (though few would define success this way), even from the reflections of one of his killers. 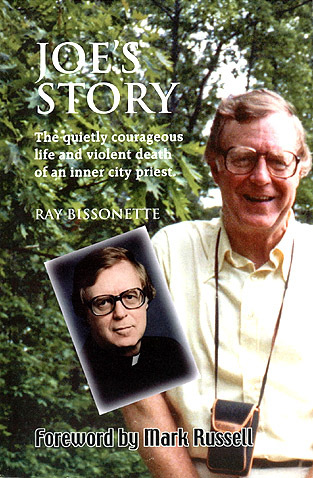 If the author Ray Bissonette, his younger brother, lived and lives in his shadow, he is far from alone. How that shadow grew and continues to spread is the long story in this brief biography. "A compelling, poignant telling of a remarkable life." "Joe was one of the good ones -- a priest whose life refutes the cynical notion that Jesus was not only the first Christian but the last." "If I ever met a saint, it was Joe Bissonette. This book is a powerful confirmation of that recollection.